Crispy shallots first debuted in our Roasted Squash Salad recipe and made their second appearance in our recipe for Roasted Stuffed Butternut Squash. 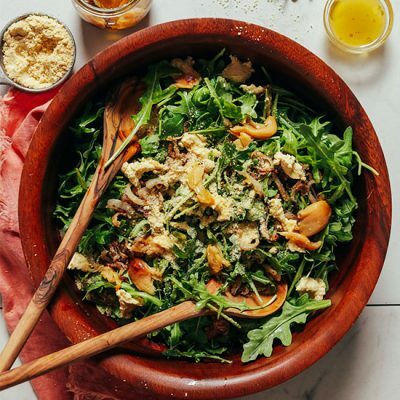 And now they’re back in this simple 30-minute, 8-ingredient salad recipe. Let’s do this! 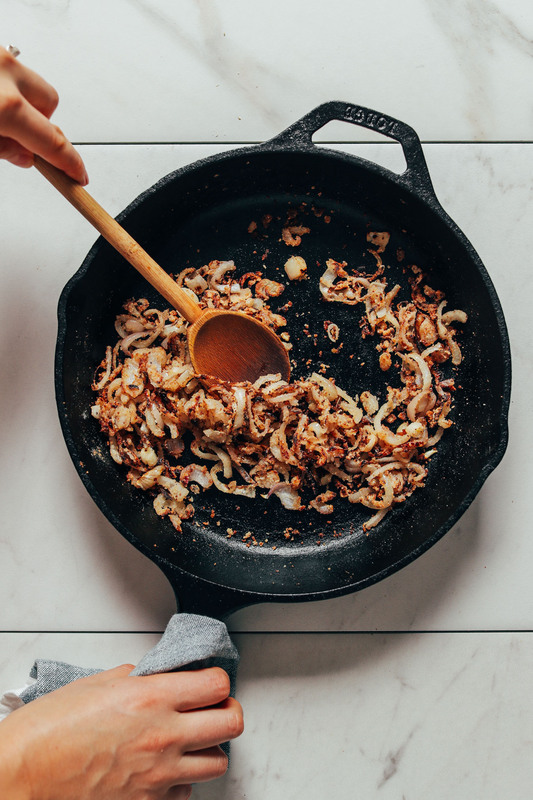 Sliced shallots are coated in brown rice flour, salt, and pepper, and then sautéed in a little oil until lightly browned and perfectly crispy. They are paired with a slightly sweet, lemony dressing that comes together in just 5 minutes. A sprinkle of cashew parmesan cheese adds a nice cheesy flavor and depth to this recipe. 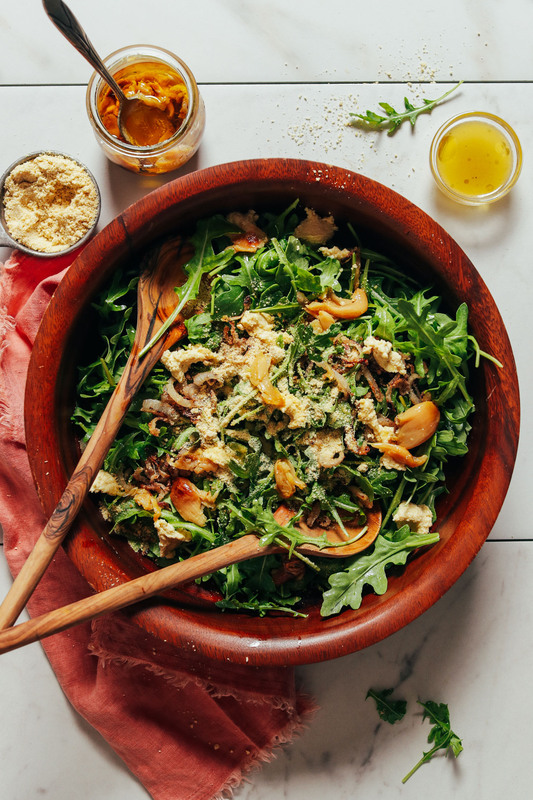 Roasted garlic, crispy shallots, cashew-based parmesan cheese, and lemon vinaigrette complement each other and balance out the bite of the arugula. And for an extra special touch, add macadamia nut cheese (optional, but delicious!). 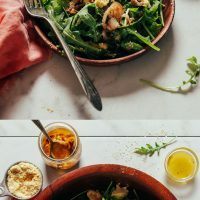 If you’re into salads, be sure to check out our Roasted Squash Salad With Crispy Shallot and Balsamic Reduction, Abundance Kale Salad With Savory Dressing, Roasted Vegetable Salad With Chimichurri, Curry Roasted Fennel Salad with Rosemary Tahini Dressing, and Curried Cauliflower, Grape, and Lentil Salad. 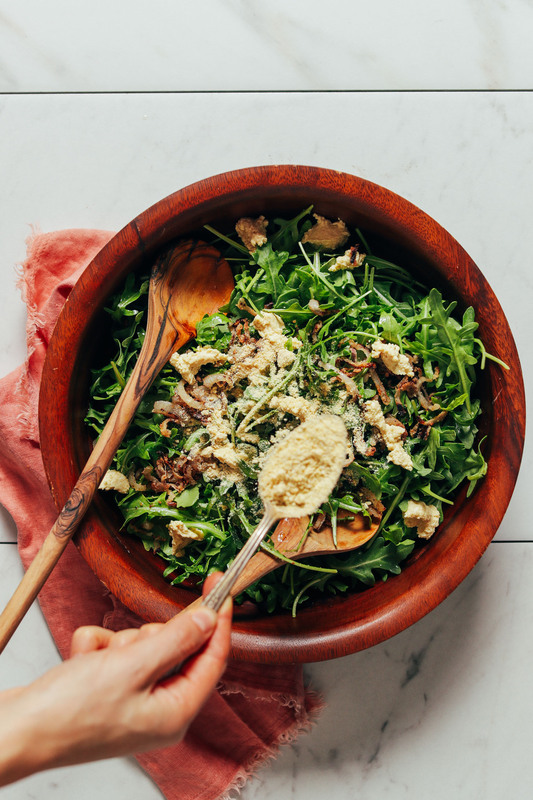 Our go-to side salad with arugula, roasted garlic, lemon vinaigrette, crispy sautéed shallot, and our 5-minute macadamia nut cheese! Perfect for hosting and beyond! To roast the garlic, peel apart garlic cloves but leave the skin on. Preheat oven to 375 degrees F (190 C). Add garlic cloves to a baking sheet. Drizzle garlic with a bit of olive oil. Bake for about 20 minutes or until the garlic is fragrant and slightly browned. Remove from oven and set aside. In the meantime, add sliced shallots to a small bowl with brown rice flour, salt, and pepper, and toss to coat. Heat a medium (preferably cast iron) skillet over medium heat. Once hot, add oil and floured shallots and sauté, stirring occasionally, until lightly golden brown and crispy — approximately 5 minutes. Set aside in pan. In the meantime, if not using store-bought soft vegan "cheese," make your own. Add macadamia nuts to a food processor or a high-speed blender along with lemon juice, nutritional yeast, garlic powder, sea salt, and lesser amount of water (1/4 cup or 60 ml as original recipe is written // adjust if altering batch size). Mix/blend, scraping down sides as needed. Then add more water 1 Tbsp (15 ml) at a time until a thick paste forms. I find I get the best texture results with a food processor, but in a pinch, a blender can work too. It just generally requires more scraping and more liquid. 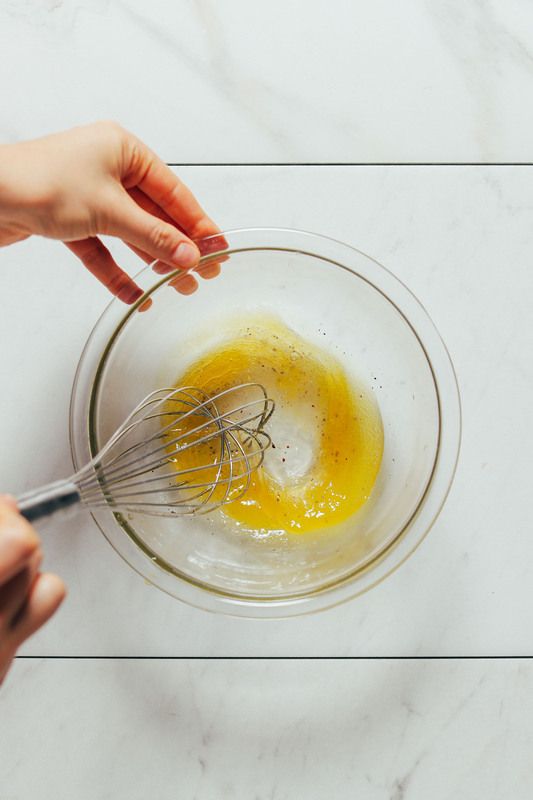 Next, prepare dressing by adding all ingredients to a mixing bowl (or small blender) and whisking (or blending) to combine. Taste and adjust flavor as needed, adding more maple syrup for sweetness, lemon for acidity, or salt or pepper to taste. Set aside. 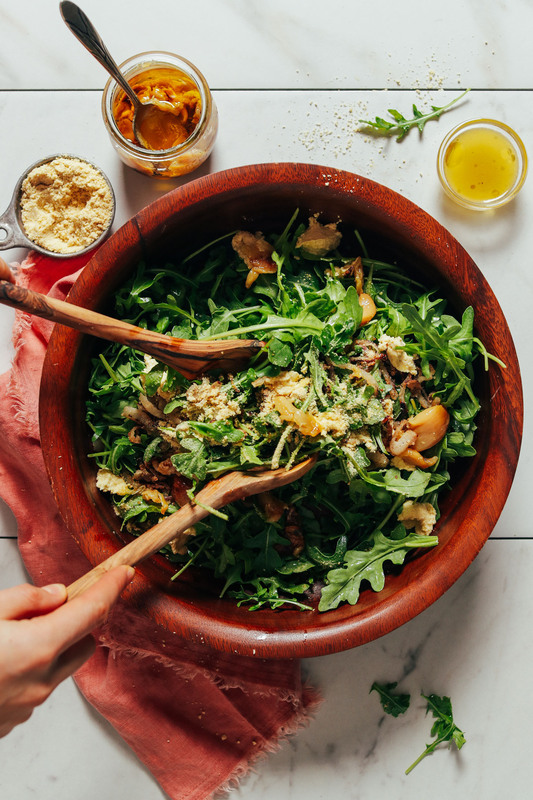 Assemble salad by adding greens to a serving bowl or platter and topping with roasted garlic cloves (skins removed), crispy shallots, macadamia nut cheese, and cashew parmesan cheese (optional). Add dressing to the salad and toss to coat, or serve on the side. Best when fresh. Store salad separate from dressing if keeping for later use. Will keep in the refrigerator up to 2-3 days. Store dressing in the refrigerator 3-4 days. The oil can harden when cold, so let dressing set out for a few minutes to warm and shake well to reincorporate before serving leftovers. 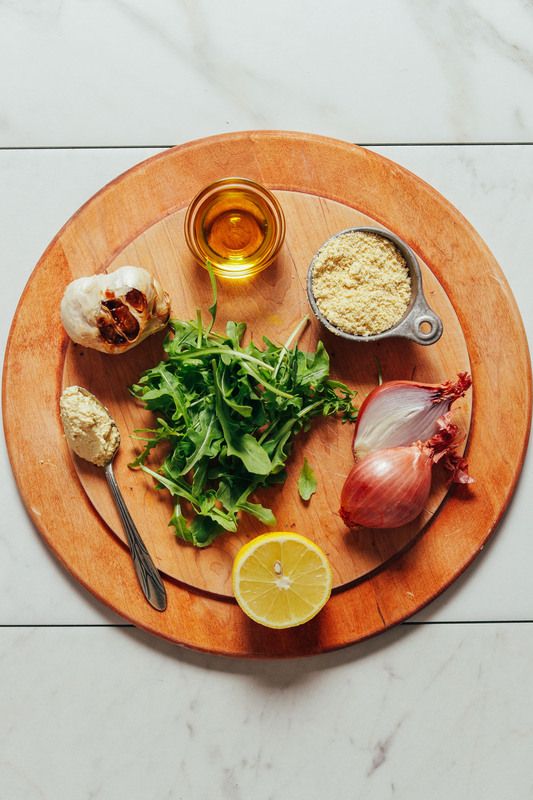 *Nutrition information is a rough estimate calculated without optional ingredients, with olive oil, and with a full serving of Lemon Vinaigrette as that recipe is written. Such a great side for Easter dinner! This was a real success. Will do it again! Lovely! Thanks for sharing, Laurie! Just made this and it was so tasty, loved the flavor the shallots added to my salad. I’m not a vegan, just a vegetarian so I tossed in a little parm. Only thing I noticed was in the directions you say to mix the flour, salt pepper and oil together and toss the shallots in that. It then says to heat the oil. I was following the directions like a zombie and wasn’t thinking about it but as soon as I tossed the oil with the flour I basically got a dough. I redid it when I realized the oil was meant for the pan obviously lol, but the directions stated that part wrong ( calling for the oil twice). I’ve made probably 30+ or more of your recipes, they are my favorite. Thank you for another deliciousness one! Thanks for letting us know! The instructions have been updated. Happy cooking! 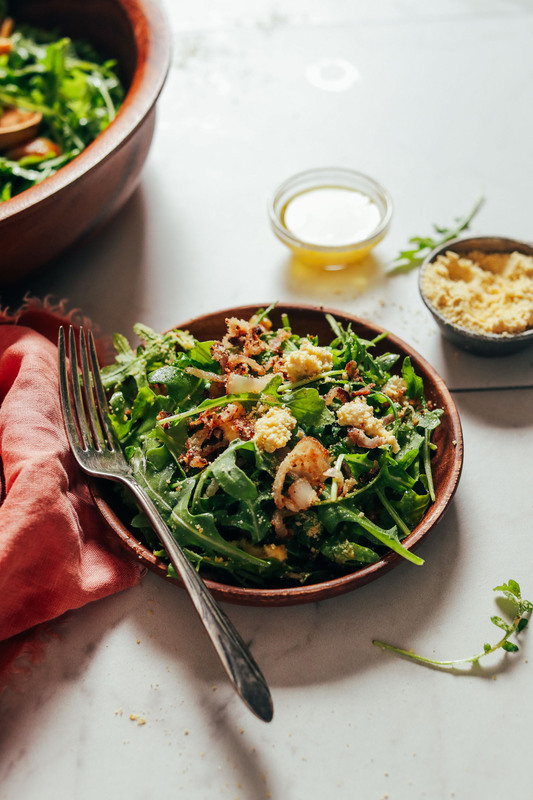 The crispy shallots sound amazing but do you really put whole pieces of roasted garlic in salad? Nope! Just a suggestion for more flavor. Crispy shallots sound sooo intriguing! I’m not GF so I don’t keep alternative flours around. Would regular all-purpose flour or breadcrumbs be a good substitute for the brown rice flour? I think a blend of all purpose and bread crumbs would be great! Keen to try this recipe and wondering if I can substitute the brown rice flour with other kinds of flour? If not gluten-free, try a blend of all purpose flour and bread crumbs! The lemony vinaigrette does not have the exact measurements in your recipe. Why indicate everything else except the dressing? Hi Sandy, if you click the link for the Lemony Vinaigrette, you will find the exact measurements. Hope that helps!